Get ready to groove! 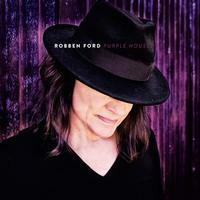 Robben Ford delivers a new studio album, easily rides on the wave of southern blues rock and convinces with a fresh and modern sound. It s the perfect album to remember warm summer nights and times on the road with the windows wide open. The album could not have come at a better time! With Purple House Robben creates an album that combines the brilliant blues rock that he is known for with catchy guitar solos and groovy rhythm sections that create a true feel-good sound. But that s not all! Purple House also features exceptional guest musicians such as Shemekia Copeland, daughter of blues guitarist Johnny Clyde Copeland, whose unique voice works perfectly in combination with the partly dirty blues guitar sound in "Break In The Chain." And in "Willing To Wait" no other than Drew Smithers is rocking the guitar solo. Grab a guitar and start playing it on the porch or simply play this album loud and often!